But imagine if you sold multiple products that didn’t really overlap in interest, like say yoga and fitness retreats to different locations around the world — for example. Your lead may only have a limited window of time they are looking for a retreat, or may be looking at a specific location. You would want to know more granularly if someone converted while looking at your retreat to Portugal in late March versus your retreat to Belize in November. That way you can better speak to that person’s needs. As it turns out, only about 80% of things are tracked. SquareSpace only communicates that a form has been submitted via what we call a “tag”. Really that’s just a little piece of code that “fires”, or is sent across the interwebs to Facebook, when a person takes some type of action on your page. In this case a form submission. One caveat here, this doesn’t include 3rd party forms like MailChimp. For that you will need to either convert them to SquareSpace forms and continue to work through this tutorial or see my tutorial on conversion tracking via Facebook and MailChimp. For this solution I have a yoga and fitness retreat website, SoulTribe Adventures. 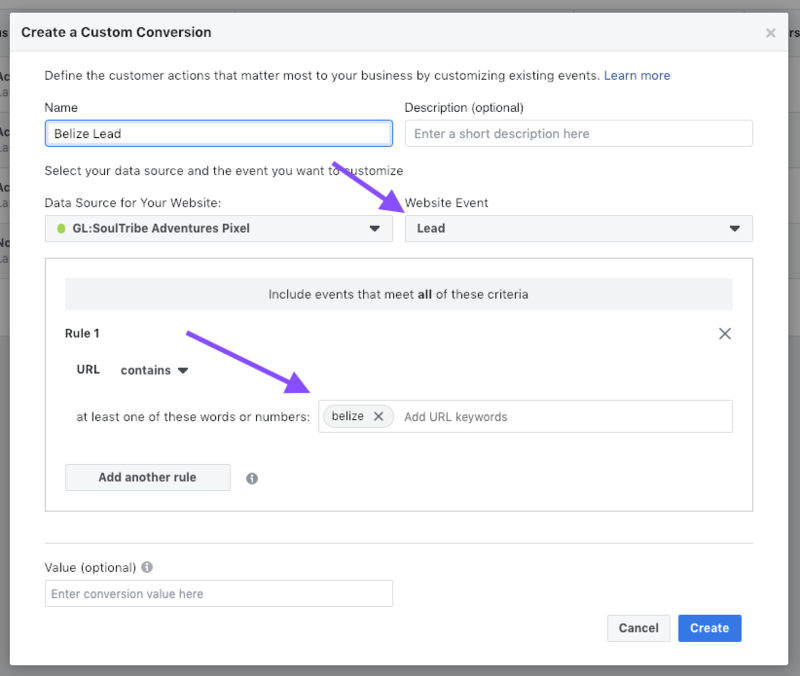 I needed to track individual conversions from SquareSpace form submissions into Facebook as leads. Because we advertise specific to a retreat we want to know if the marketing was effective per retreat so we can better adjust our ad spends, landing pages, offers, etc. The first step is to go to your Facebook business manager and then navigate to Custom Conversions. At the time of writing its under: All Tools -> Measure & Report -> Events Manager -> Custom Conversions but is subject to change of course. Set the URL contains ( you could use ‘equals’ if you prefer') to something unique in the page you want to track's URL. In this case I know that if someone is on the page https://www.soultribeadventures.com/belize and submits a form Facebook will count it as a Belize Lead. Click create and move along! Let’s stop here for a moment. If I had left the Website Event dropdown set to type All Url Traffic but set the URL contains to belize. Then I would have seen all viewers of the page with belize in the URL, not just people who submit the form. Likewise if I had set the dropdown to its proper event type of Lead, but didn’t set a value for the URL contains, I would have been tracking leads (form submissions) from all pages on my site. Neither of these things is desirable for me. Next, you will go into SquareSpace and open a form on your page you want to track. Click Apply and Save the page and then go into preview mode or view the site live. Test the form and voila! Facebook will pretty much instantly confirm that your new Custom Conversion is working and the icon next to its name will turn green! That’s all there is to it. Now go add the code to all of your forms on all of your pages!